250 kg. 25 individual sealed 10 kg packages. Wood fire briquettes is 100% ecological bio-fuel for your fireplace, stove or heating boiler. They are produced from hard wood and have superior efficiency of burning. Burning briquettes is easier, and "greener". The emissions are 10 times less than wood, 20 times less than gas or diesel and 50 times less than charcoal. Don't buy wood! Save ecology, money and your time! Keep your house clean and warm with fire briquettes. Certified 100% natural hot-pressed briquettes is the future of your house heating. Very popular in France, Italy, Germany and other European countries now available in Cyprus. Made in EU. Free Door Delivery in Cyprus: Our delivery team will arrange date and time of delivery and bring your order to you. Free delivery includes unloading at the spot, where the delivery car can park. For heavy loads please check the additional unloading charges. Unloading with the Trolley: If your storage spot is located inside your premises, please select this option if you need our delivery team to unload the goods and place them in your storage. This option is suitable for you if the delivery team can use a hand truck (trolley) to transport goods to the desired location. Manual Unloading: If you want us to unload your order to the location inside your premises, but there is no access for the trolley (uneven ground, stairs, gravel paths or any other obstacles on the way) and the unloading has to be by hand, please use this option. Q: What exactly is "Wood Briquettes"? A: Wood briquettes is one of the most efficient fuel for wood burning stoves. I is made from sawdust of hardwood which is dryed and compressed under high temperature. It does not contain any glue or chemicals. "RUF" standard means that sawdust is dried up to certain humidity and then it can form a briquette without any additives. Q: What is the size of briquettes? A: Each brick is 6x9x15 cm and the weight is 800 gr. They are packed in plastic 12 briquettes per 10 kg package. Q: Can I burn them in my stove/fire place/woodburner? A: Wood Briquettes are suitable to burn in any type of stove which is made to burn logs (ordinary wood). Open or closed fireplaces, wood stoves, boilers, wood heaters etc. Q: Do they burn with flame? A: Yes, they produce flame like normal wood. Q: How long do they burn? A: Burning time depends on many factors like airflow, burner type, etc. But certainly the efficient burning time is longer than ordinary wood. The only measurrable characteristic to compare with other types of fuel is the energy of burning. Q: What amount I should order for winter? A: This question is very individual. It depends on how cold it is outside, how good is your insulation, windows and walls, how efficient is your wood burner, what space you have to heat etc. Based on our experience the average is 750-1000 kg but some houses were ok with 500 kg, some needed 1300-1500. Everything is individual. You can mix them with ordinary wood as well. Q: How Should I store them? A: The only requirement for storage is to keep them away of direct rain. You can store them outside covered and slightly detached from the ground. Or you can store them in your shed, garage or wood storage. There is no problem to store them inside the house, briquettes don't produce any bad smell or anything like this. Q: What space do I need to store them? A: As an example of one ton (1000 kg) will take 1 square meter of floor and 1.5 meter high. They are very compact and ergonomic to store. Basically you can fit 1000 kg in 1.5 cubic meter of space. Q: Do you really deliver for free? If I live in Pegeia or in the village? A: The only requirement for delivery is the road. If you have one, you will get them delivered for free. Q: How long it takes from the order to actual delivery? A: It depends on season. In Cyprus everybody order when it starts to snow :) We are doing our best to make deliveries within 1-3 working days. Sometimes we had cases when the order was delivered within 20 minutes because we load extra amount in our cars in case of order in delivery area. But usually give us a day or so. Q: Is it possible to use them for cooking? For oven? A: Briquettes are 100% ecological and don't contain any chemicals. You can use them for cooking. Q: Do you have wholesale special price? A: If you are interested in amounts exceeding 5 tons, please call us to discuss the price and delivery options. Q: Are they easy to light and burn? A: Briquettes are very dry (only 5% of humidity) so they light easy. We recommend to use the firelighters like the ones for barbeque but you can use small pieces of wood or paper or anything you use for ordinary firewood. Q: If I still have questions? A: Just call us 22 57 37 39 and we answer them with pleasure! - "diplocambina" of firewood is unknown volume and weight, because you can put it in different ways so you buy air anyway. The quantity of air depends on honesty of the supplier. The weight is also not a measurement because dry firewood has 20-35% of humidity. Buying 250 kilo of wood you also pay for 50-90 liters of water. - you don't know exactly which wood is inside. Most of the time it is mix so the quality and efficiency varies. - when you buy dry wood it means the tree died in forest. 85% of trees died because of bugs and other insects. 99% of suppliers and vendors don't do any fumigation of wood. Even imported from EU wood most probably don't have any certificates and fumigation because there is no customs within EU. Bringing ordinary firewood to your garden or house you pose yourself to big risk. These "wood eating" bugs attacking your healthy trees and wooden furniture. One "Diplokambina" of wood is approximately 0.6-0.8 cubic meter or 250-300 kg of wood. The average price is 120-160 euro for pine or mix wood. Olives and tarracha is almost double. 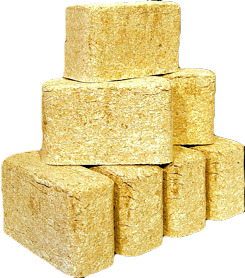 For 110 Euro we are offering 250 kg of briquettes. So the total heat energy is about 1.2 Million kilocalories (kcal). 300 kilo of dry pinewood will give you maximum only 660000 kilocalories. It is twice less for more money. Briquettes burn longer. Less smoke and ash (2 kilo of ash per 1000 kilos of briquettes) so you don't need to clean your fireplace often.